The State of Illinois recently enacted legislation designed to close a $1.6 billion budget gap for the fiscal year ending on June 30, 2015. This blog post reviews the causes of the operating deficit and examines Public Acts 99-0001 and 99-0002, which were signed by Governor Bruce Rauner on March 27. As explained here, the State faced a steep decline in revenues in FY2015 because of the partial rollback of temporary income tax rate increases on January 1, 2015, midway through the fiscal year. Instead of reducing spending or increasing revenues, the budget passed by the General Assembly in late May 2014 used short-term measures—including borrowing and shifting revenue from FY2014—to cover operating expenses. The enacted FY2015 budget appeared on paper to be roughly balanced with a modest surplus of $8 million, according to documents filed in connection with the sale of State bonds. General operating expenditures of $35.76 billion exceeded general operating revenues of $35.11 billion by $642 million, but the deficit was closed by authorizing borrowing of up to $650 million from accounts outside General Funds, a practice known as interfund borrowing. In addition, Medicaid expenses were understated in the FY2015 budget because $600 million in FY2014 General Funds revenues were used to pay for FY2015 Medicaid costs. Despite these measures, the enacted FY2015 budget did not fully cover known State costs. According to the bond documents, the budget did not include hundreds of millions of dollars in costs that would have to be cut, funded through supplemental appropriations or deferred until the next year. Pat Quinn, who was then Governor, signed the budget but described it as incomplete. The following table compares two versions of the FY2015 budget: the enacted budget as of July 2014 and the latest published version available, as of February 2015. The revised FY2015 budget plan was issued in conjunction with Governor Rauner’s recommended FY2016 budget. 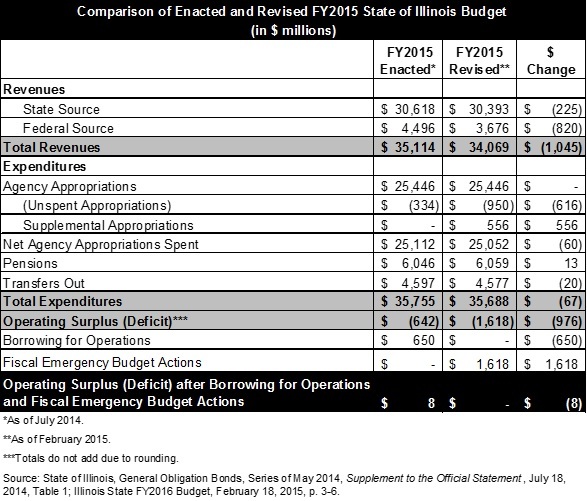 As shown in the table, the revised FY2015 budget plan did not include interfund borrowing, which created an FY2015 budget gap of $642 million. The gap widened by another $556 million due to proposed supplemental appropriations to cover known costs that were not appropriated in the enacted budget. The other major cause of the FY2015 deficit is a shortfall in revenues. As discussed here, General Funds revenues in FY2015 are now expected to lag previous projections by more than $1 billion. Revenues from State sources are down by $225 million, mainly because of unexpectedly low corporate income tax collections. The revised FY2015 budget issued in February showed “fiscal emergency budget actions” of $1.6 billion to plug the deficit but did not specify the nature of those actions. The solution agreed to by Governor Rauner and lawmakers was to transfer $1.3 billion into General Funds from other State funds and reduce spending by approximately $257 million. Legislation to close the gap was introduced on March 23 and signed four days later. The transfers, known as sweeps, are different from interfund borrowing because they do not have to be repaid unless the affected accounts run out of needed resources. Public Act 99-0002 authorizes transfers from 106 different funds, ranging from $250 million from the Road Fund (which is used for road construction and maintenance) to $110,000 from the Low-Level Radioactive Waste Facility Closure, Post-Closure Care and Compensation Fund (which was created to pay costs related to the closure of waste disposal facilities). It should be noted that balances in the affected funds have grown over time, meaning that the amount of surplus resources available in the near future would be smaller. The second component of the legislation, Public Act 99-0001, changes FY2015 appropriations, with both increases and decreases. The net spending reduction of approximately $257 million consists of cuts of $444 million, offset by increases of $187 million. To achieve the reductions, the General Funds appropriations of most agencies were cut by 2.25%. Certain programs were exempted from the spending cuts, including services for the mentally ill and developmentally disabled. Funding for the Illinois State Board of Education was reduced by approximately $147 million. The spending increases include $97 million provided to the Board of Education to assist school districts in financial distress and $90 million to be used at the Governor’s discretion to plug budget holes. Medicaid reimbursement rates for most healthcare providers were subject to the 2.25% spending cuts; the impact on federal revenues is not yet clear. Hospitals avoided the full effect of the cuts by agreeing to an additional assessment, which requires the payment of $27 million instead of rate cuts of at least $55 million. The effect on the State is the same because a reduction in State Medicaid spending of $55 million would have generated State savings of only about $27 million due to the loss of federal reimbursements. Public Act 99-0001 also provides for spending authority for unbudgeted costs that were shown as supplemental appropriations in the revised FY2015 budget. The total is approximately $543 million (reduced from $556 million in the revised FY2015 budget), with $266.4 million to subsidize child care for low income, working families and $114.1 million to pay prison guards. After the agreement on the FY2015 budget, the Governor and legislators said they plan to begin work on the budget for the upcoming fiscal year, which starts on July 1. As discussed here, Governor Rauner’s recommended $31.5 billion FY2016 budget proposes a new plan to reduce the State’s massive pension costs and deep agency spending cuts, including reductions to child care subsidies and Medicaid payments to hospitals.